Last year, Matt Baldin and Sam Reinehr were happy just to qualify for the world finals of the ACM International Collegiate Programming Contest. This year, the Mines seniors have much bigger plans. Baldin and Reinehr will have a chance to do just that, after winning the Rocky Mountain Regional for the second year in a row, with new teammate Joseph McKinsey. The trio solved all 10 problems at the Nov. 3 regionals, besting more than 60 other teams from Colorado, Utah, Montana, Arizona and two Canadian provinces to claim the region’s lone spot at the most prestigious collegiate programming competition in the world. 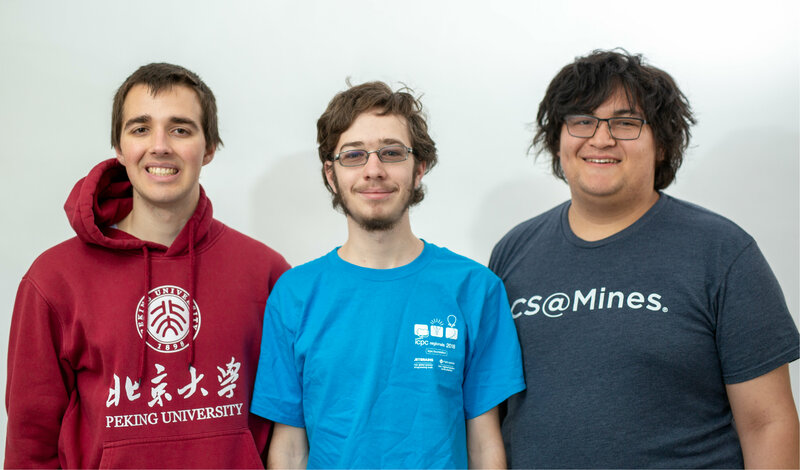 The Mines team, ((+)(((+)s)m)j) — a computer science joke that combines their first initials — will travel to Portugal at the end of March for the 2019 ICPC World Finals. There, they will have the chance to compete against the best collegiate programmers from Asia, Europe, Africa, North and South America and Australia. Baldin and Reinehr have been preparing for this year’s competition more or less since they arrived home from the 2018 Worlds in April. After receiving honorable mention in Beijing — the “best of the worst,” in their words — the two friends changed up their practice routine and started doing full five-hour mock competitions to better simulate the team experience at regionals and worlds. They also attended a training boot camp in Barcelona, Spain, taking a two-week break from school to “live and breathe competitive coding,” Reinehr said. That’s where McKinsey comes in. A sophomore majoring in applied mathematics and statistics, he joined Baldin and Reinehr on the team after getting to know the guys through the Putnam math club. “I hadn’t been to any events before, but I had done project-oriented programming and programming problems in high school. I’ve always been interested in that,” McKinsey said. For him, the appeal of competitive programming has been getting to flex his problem-solving skills on more practical problems than the more abstract world of Putnam. “It’s nice – you have a problem and you’re not sure how to solve it and you have this toolkit of everything you know. Sometimes you have just methods that you can apply to it and try to figure it out. Sometimes I won’t be able to see it and then Matt will just come by and be like, ‘Oh yeah, it’s X.’ I like that,” McKinsey said. At regionals, the trio led the field the entire time, solving nine of the algorithmic problems within the first three hours and then spending the next 90 minutes working out the 10th and final problem. In the competition, teams earn points for each problem they solve and for how quickly they come up with a correct answer. They ended up being the only team to correctly answer all 10 questions — and they did so on the first attempt for each and every question. Baldin is graduating in December with his bachelor’s degree in computer science. He’ll stick around another semester, though, to finish his master’s degree and said he hopes that McKinsey can help carry on the Mines legacy after both he and Reinehr move on. “We wanted to chain the teams because we want to see Mines continue to succeed in this competition – we’d like to see Joseph carry the torch,” he said.